Review Freesat, launched three years ago, hasn’t quite caught the imagination in the same way as Freeview HD, but if you don’t have terrestrial coverage, or you want more channels than Freeview provides, without having to go for pay TV, it’s a good option. 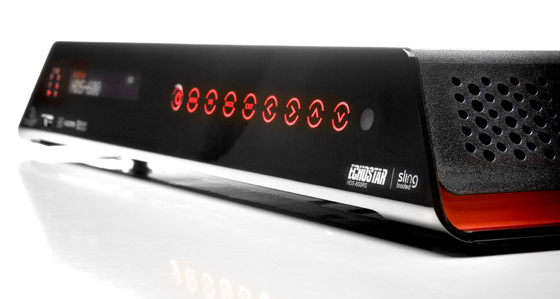 Echostar’s HDS-600RS is a digital recorder designed for Freesat that offers a unique extra – it has Sling’s software built in – enabling you to access it using the internet when you’re away from home. A few years back, we’d have said that was a unique feature, and it’s still useful to some – though arguably a large proportion of punters will find services such as the BBC iPlayer will suffice. 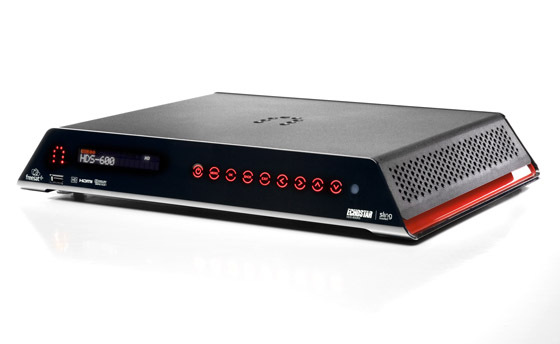 Sling services aside, the Echostar is a fairly standard twin tuner satellite recorder with a 500GB hard drive; it’s a slightly unusual shape, with sloping sides reminiscent of a slingbox, and the remote is similarly wedge-like, though surprisingly comfortable in the hand. It can be programmed to control the TV too. There are no physical buttons on the front; everything’s touch controlled using a panel that lights up brightly and, to be frank, distractingly. The worst offender is an animated indicator when the Sling functions are being used, though thankfully it can be turned off. Also worth noting is that the USB ports are for software updates only; the Sling functionality is the only added extra, over and above Freesat’s standard menu of live TV, recording and access to the iPlayer from the red button. You can’t transfer recordings to an external disc, or view photos from a USB key. And even though there is an ‘Apps’ menu, at the moment it’s just home to the Sling remote software.